ISRAEL has been asked by the two sons of Adolf Eichmann to hand over the memoirs he wrote in his prison cell during his trial and in the countdown to his execution in 1962, writes Ohad Gozani in Tel Aviv. A spokesman for Elyakim Rubinstein, the attorney-general; said yesterday that the matter was under consideration. Eichmann was kidnapped by Israeli Mossad agents in Argentina in May 1960 to stand trial before a special tribunal in Jerusalem. Subsequently convicted and sentenced to death, he was hanged and cremated in May 1962. JERUSALEM (AP) -- In 1,300 notebook pages filled with his dense, Gothic-style handwriting, Adolf Eichmann gave his account of the Nazi plot to exterminate Europe's Jews, trying to portray himself as Hitler's loyal disciple rather than a mastermind of the Holocaust. Eichmann's sons and Israeli Holocaust researchers are now demanding that Israel release the thick jail house memoir, which has been locked up in Israel's State Archives since Eichmann's execution by hanging in Jerusalem in 1962. Israel's Justice Ministry said Wednesday it was considering the requests and a decision was expected soon. Eichmann oversaw the deportation and murder of millions of Jews during World War II and promoted the use of gas chambers in death camps. In all, 6 million Jews perished in the Nazi genocide. After the war, the onetime traveling salesman escaped to South America. He was kidnapped by Israeli agents in Buenos Aires, the Argentine capital, in 1960 and brought to Israel, where he was tried and executed for crimes against humanity. In the memoirs he wrote in his Israeli prison cell, Eichmann expanded on the line of defense he adopted during the trial, according to Israel State Archivist Evyatar Friesel, one of just a small group of historians who have read excerpts of the writings. Eichmann remained unrepentant, trying to back up his contention that he was merely a mid-level official, Friesel said. In the memoirs, Eichmann quoted from war-era documents and provided a detailed account of the Nazi policy toward European Jews, chronologically and country-by-country. Friesel and his colleague, Yehuda Bauer, who heads the research institute at the Yad Vashem Holocaust Memorial, said the pages give no new historical insights. Still, Friesel said he had the impression that Eichmann's attitude toward Jews was less hate-filled in the prison writings -- although he could not cite examples. Tom Segev, an Israeli journalist who has written extensively on the impact of the Holocaust on Israeli society, said Israel should release the manuscript immediately. "Israel can't hide a document like this," Segev said, noting that Israel has asked other countries to open their Holocaust archives. "It's scandalous." Segev said the State Archive informed him that legal issues need to be resolved before the stack of papers can be released. Segev speculated that Israel might not want the text published because of concerns that Eichmann's attempt at a whitewash will be used by neo-Nazis and Holocaust deniers. Segev said the historical importance of the manuscript outweighed such risks. The German daily Die Welt on Tuesday quoted two of Eichmann's sons, Ricardo and Dieter, as saying the manuscript should be released. The men did not say why they were seeking its release now or explain what would be done with it. Ricardo Eichmann, a professor of Middle Eastern archaeology in Berlin, appeared to suggest it should be used for research and not for profit, though he said he was not speaking for the family. "If it was up to me, a copy should be sent to an archive in Germany and I really don't care who gets the original," Die Welt quoted him as saying. 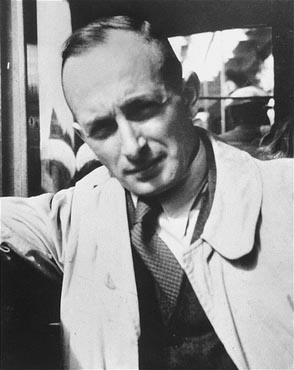 Dieter Eichmann, who has represented the family's interests in the past, said the manuscript was the Eichmanns' property and had to be handed over. Die Welt said Dieter Eichmann has asked an attorney to handle the matter. The newspaper noted that Eichmann's defense attorney in the Jerusalem trial, Robert Servatius, had tried unsuccessfully in the 1960s to have the text released. Israeli Justice Ministry spokesman Ido Baum said the attorney general will soon review the matter and make a decision. Friesel, the archivist, said he recommended making the manuscript public, but only in a scholarly framework. But Segev said Israel could not justify imposing restrictions. "Who has a monopoly on the history of the Holocaust?" he asked.